The perfect combination of beauty and world class protection, the DBAUM fireproof safe is a pleasing accent to any home office decor. Featuring rugged metal fire doors with a walnut finish, sturdy drawers, excellent fire rating, as well as impact protection. All the protection you need in an attractive package. Every Phoenix Safe is manufactured to the highest quality standards and features an all-steel construction, inside and outside. Interior: 20.25"H x 15"W x 13"D . Commercial Fire Rating of Class 350 1.5-Hour (90 minutes). Digital Protection: Fire Rated MTC Class B 60 minutes for CDs, DVDs, USB Drives, and Memory Sticks. Smooth, genuine walnut door and drawer panels with a smoke and heat-resistant frame structure. Includes 1 adjustable shelf, 1 adjustable drawer, and key hanger on inside of door. Fingerprint Lock that can also be used as a Digital Lock programmable with 4-16 digits. A bolt-down kit is included so that this safe can be bolted to the floor for added security. Impact Rated: The impact test includes dropping the safe 30 feet onto concrete rubble, then reheating in the fire. This simulates actual conditions in a fire when the floor gives out. 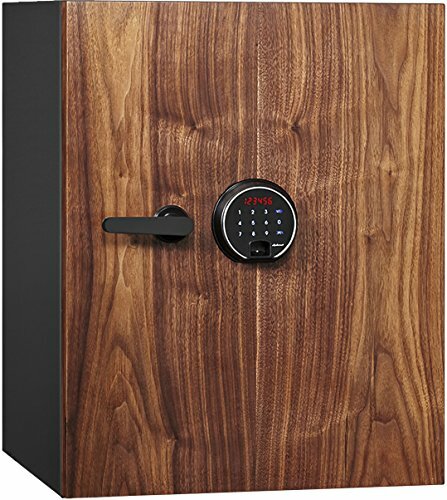 Warranty: 3-Year Parts and Labor on the safe and lock. Lifetime After-a-Fire Replacement Warranty: If your safe is ever in a fire it will be replaced at no charge. If you have any questions about this product by Phoenix Safe International, contact us by completing and submitting the form below. If you are looking for a specif part number, please include it with your message.